Get back on your feet and back out there after surgery with the FUTURO Anti-Embolism Knee-Length Stockings. These compression stockings feature graduated compression to enhance circulation in the leg, helping to decrease the chance of blood clot formation following surgery. Made with soft, durable materials and specifically designed for the recuperating patient, the FUTURO Anti-Embolism Knee-Length Stockings help you take steps toward a healthy, active future. 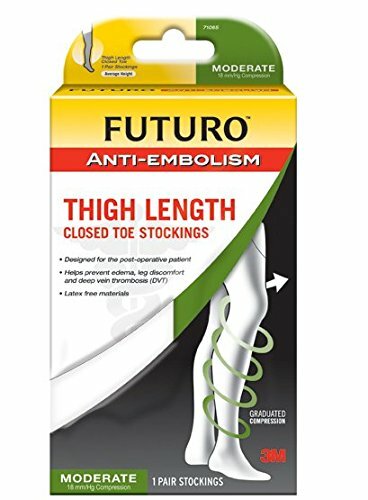 Get back out there after surgery with FUTURO Anti-Embolism Thigh-Length Stockings. 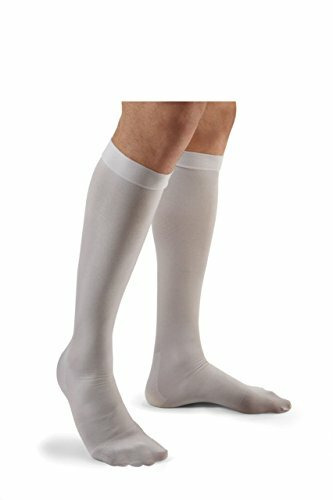 These compression stockings feature graduated compression to enhance circulation in the leg, helping to decrease the chance of blood clot formation following surgery. Made with soft, durable materials and specifically designed for the recuperating patient, the FUTURO Anti-Embolism Thigh-Length Stockings help you take steps toward a healthy, active future. 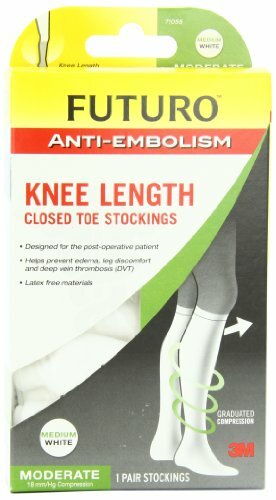 This listing is for a single box of Futuro Anti-Embolism Thigh Length Closed Toe Stockings in Large size, White color, and Moderate Compression. Model Number: 71068EN. Each box contains one pair of stockings (2 single stockings) in total. 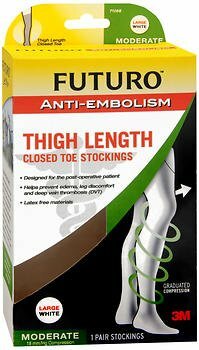 See photos for more details.Get back out there after surgery with FUTURO Anti-Embolism Thigh-Length Stockings. These compression stockings feature graduated compression to enhance circulation in the leg, helping to decrease the chance of blood clot formation following surgery. Made with soft, durable materials and specifically designed for the recuperating patient, the FUTURO Anti-Embolism Thigh-Length Stockings help you take steps toward a healthy, active future. Designed for the pre-or post-operative, mobility-impaired or non-ambulatory patient. Help yourself recuperate properly so you can get back out there. Futuro anti-embolism stockings provide the medically proven benefits of graduated compression to offer effective support, as well as soft, durable materials for outstanding comfort and fit. Our graduated compression stocking knitting technology is specifically designed to speed blood flow by providing the most compression at the ankle and gradually diminishing pressure up the calf. Moderate, graduated compression which accelerates blood flow up the leg, helping to reduce the dangerous formation of blood clots following surgery. Knee length. Specifically designed for the recuperating patient.